Oceanfront Executive Home with a Boathouse! This luxurious 5 bedroom, 4 bath home has it all! The open concept kitchen, breakfast area and living room with propane fireplace span the back of the home with access through patio doors to the back deck, extending your entertaining area. A formal dining room off the kitchen means lots of space for a crowd. Through from the dining room is a sitting room offering extra space and an ocean view. The main floor also conveniently features a half bath and laundry room. Upstairs boasts a huge master bedroom with ensuite including a corner jetted tub, 3 regular bedrooms and a main bath. The finished basement offers even more space and boasts a rec room, additional bedroom, half bath and storage area. The landscaped grounds feature covered front and rear decks, a double attached garage and a 20x24 detached garage. 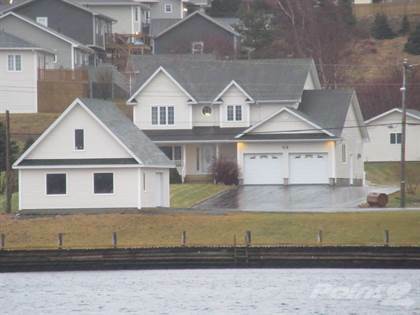 Across the street, on the water is a fabulous boathouse and a 50’ x 8’ wharf! Call today to schedule a viewing of this stunning home! Hi, I'd like to find out more information about 90 George Mercer Drive. Thanks so much!